How about more tolerance for ambiguity? 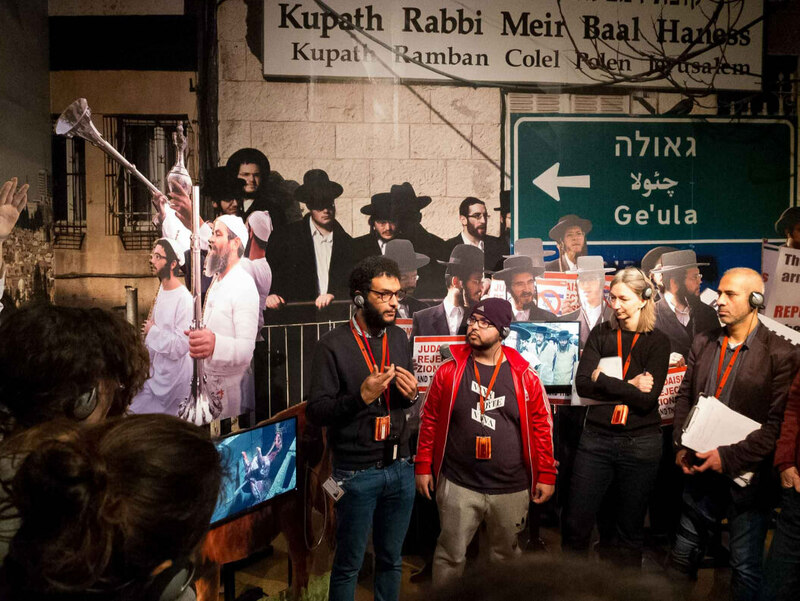 Since April 2018, we’ve offered a tandem guided tour called Jerusalem in Dialogue (more about the tour) through our current temporary exhibition Welcome to Jerusalem (more about the exhibition). On each tour, two guides with their own personal relationships to Jerusalem speak from different perspectives about the city and the exhibition, which runs until 30 April 2019. The format of a tandem tour emerged from a museum-guide training session (more about the training) that we conducted together with the Hochschule für Technik und Wirtschaft Berlin (HTW), a university of applied sciences. The German-Palestinian Mohamed Ibrahim and the Israeli Shemi Shabat contributed to its development and now oversee it together. Andy Simanowitz spoke to the two about the training, the concept of the tandem tour, and their relationship to Jerusalem. Andy Simanowitz: To begin with, could you introduce yourselves and your work a bit? Shemi Shabat: I’m Shemi. I was born and raised in Tel Aviv and I came to Berlin 11 years ago. At that time, a colleague asked me what I would think of developing workshops on the Palestine/Israel Middle-East conflict together with a Palestinian. 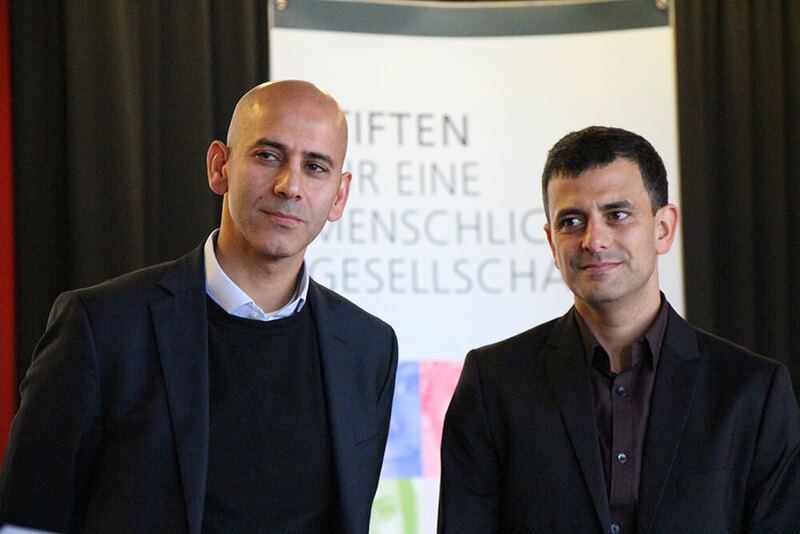 At this point, we’ve been doing it for 10 years, going together to schools as a German-Palestinian and an Israeli to talk with students about the Middle East conflict. It’s now my second source of income; I’m also a consultant for the antidiscrimination network of the Turkish Federation in Berlin-Brandenburg. Mohamed Ibrahim: I’m Mohamed, a German-Palestinian who has been living in Berlin for over 40 years. I was born in a refugee camp in Lebanon and I grew up in West Berlin. I studied politics here with a focus on international relations. My regional focus was the MENA region and the Middle-East conflict. My main occupation is development work at a federal implementing organization. As Shemi said, I’ve been doing these trainings with him for over 10 years. What’s special about your concept? Mohamed: The special part is that we always work as a pair. The concept’s resource-oriented approach is also of interest, so the participants are really at the center. We think that the participants can get specialized information on the topic elsewhere. The important part is that they—with their individual relationships to the topic—are at the center of the discussion. Shemi: The unique point is that two people are standing there with different backgrounds and different attitudes, but they don’t fit the stereotypes. You expect Mohamed, as a Palestinian or a Muslim, to say this or that. But he doesn’t. It creates a moment of irritation—and I’m also someone who grew up in Israel, but who views the situation critically and can express himself about it. It’s a very interesting thing for the young people to see. How did you end up working with the Jewish Museum on this project? What exactly is a tandem tour in your minds, and how is it different from a normal tour? Mohamed: The tandem tours should work in the same way that our tandem workshops do: unlike in a traditional tour, the objects or a topic are not the focus of attention, but rather the guides themselves. The visitors experience the interaction between the guides, with their different personal backgrounds and perspectives. Shemi: The concept is also interesting because it takes up the museum’s desire to initiate an interaction with the visitors. I don’t present something and then get feedback, but rather an interaction occurs during and within the framework of the tour: a conversation, a dialogue. Why was this project especially suited to the Jerusalem exhibition? Mohamed: Jerusalem is a holy place that is (or can be) an object of contention, and it’s obvious that there are different perspectives on this holy place. Shemi: I think the Jewish Museum wanted to show Jerusalems, in the plural. Instead of giving just one image of the city, they wanted to show the city in its multi-perspectival aspect, in its complexity, with its contradictory nature. And so this format is very suitable, because our methods can show this diversity, the conversations, the contradictions and conflicts, all of the difficulties and givens, which can otherwise be hard to communicate. One critical response in the museum’s internal discussion was that a tandem tour with an Israeli and a Palestinian presents a dichotomy that we would actually like to refute in our engagement with the topic on an objective level. What do you have to say to this concern? Mohamed: I don’t see it that way. When we go into a classroom, each with our different backgrounds, and lead our Middle-East workshops, then of course at first this black-and-white thinking is there. They expect a certain perspective from me, but I don’t meet this expectation. I see things similarly in the case of the training sessions, that we shouldn’t reproduce this black-and-white thinking along the lines of individual backgrounds and attributes, but rather we should play with confounding expectations. We believe that this approach works out. Shemi: This fear would only be justified if we had to assume that every tandem only consisted of two positions. But that’s an oversimplification. It underestimates the concept of the tandem and simply doesn’t recognize people as wholes. There are two people, of different ages, with different relationships to Jerusalem. They don’t just belong to certain religions, but rather they also have a particular attitude toward their religion. That means that the constellations aren’t identical. We’re experiencing that now on the tours; it really depends on who is leading them. In our understanding, a tandem doesn’t just work on one level or because of a single (ethnic, religious, or national) characteristic—he’s a Palestinian, she’s an Israeli, she’s a Muslim, he’s a Jew, with the one representing the one thing and the other representing something else. In this respect, the tandem isn’t just a method but also a stance that presents dialectical contradictions through dialogue. But the dialogue doesn’t simply occur between two static points of view or sole identities that are diametrically opposed, but rather between people who incorporate all of the aspects of their complex and varied identities. Once the group of tandem guides had been assembled and it was clear how interesting, how diverse, and how heterogeneous the group would be, it became obvious that not just one product would emerge here, but many—and that has real value. What were the biggest challenges in training the guides? Mohamed: I think it was that the participants had different expectations and goals. Harmonizing them was a real challenge. For example, for some of them the exciting part was working at the Jewish Museum, while others were more interested in the topic and development. Shemi: And then there was the exhibit itself! In the past, we had given workshops for training session leaders in inter-religious/inter-cultural areas, but this was our first time in a cultural institution, in a museum, in an exhibition. And when we held the preliminary seminar in November 2017, the exhibition wasn’t even up yet. The group quickly pulled together at a three-day seminar in Blossin, Brandenburg. But there was still this big question mark in the room: the exhibition—what will be expected of us from the museum side, that is, according to the mission statement? In the first meeting with Léontine Meijer-van Mensch, the museum’s program director, it became clear that the guides really did have a lot of freedom to make their own contributions, to develop something new, to also enter into dialogue with the exhibit itself and not just with their tandem partner. You mentioned the preliminary seminar in Blossin. What was developing the tours like in general? Mohamed: The group really jelled astonishingly quickly on a personal level. Everyone was very open and curious. The concept completely depends on having a personal relationship to Jerusalem, and everyone really opened up personally very quickly, especially at this weekend seminar. I believe that there was this fear at the beginning: ‘Should we present a particular Jerusalem? How do we talk about the conflict?’ But in the end it was a really beautiful moment to realize that it’s good how we are, and that’s how we’ll present ourselves. We don’t need to discuss the Middle-East conflict among ourselves and solve it before we can present ourselves together. To close: what is your relationship to Jerusalem? Mohamed: I don’t have any personal relation because I don’t have any family there. But with my Muslim background, when I’m there, I go to the Al-Aqsa Mosque to pray. That’s my relation to Jerusalem. Tel Aviv is very similar to Berlin from my point of view, and so I’m familiar with it, but I find Jerusalem totally fascinating, with its many contradictions. Shemi: I was born and raised in Tel Aviv. I’ve always had an ambivalent relationship to Jerusalem. I have family there and I often went to weddings where men and women danced and ate separately. The city is a political issue, the location of my activism: East Jerusalem, occupation, demonstrations, and solidarity. I also worked for a few years in Jerusalem for Mahapach-Taghir, at a community-based NGO that engaged for empowerment in underprivileged neighborhoods. I myself am not a religious person, and I didn’t always like being there, but I think that this project has given me the opportunity to engage with the topic again from a distance, that is, the distance of 3000 kilometers from Berlin and 11 years of separation. Engagement at this distance, with the help of other perspectives and other people, who weren’t born there and don’t live there, that was a very interesting new experience. The opportunity to deal with this in a conciliatory way at a point where I thought there was no more possibility of conciliation. Mohamed: You’ve made your peace with Jerusalem. Shemi: Peace? That’s a big word. Maybe a tolerance for ambiguity? This interview was carried out by Andy Simanowitz. He is involved in the project through the Education Department.